A barbecue fish kebab recipe requires a meaty fish. If flaky then it disintegrates too easy off the skewer and falls through onto the coals so for this recipe I’ve chosen swordfish which is ideal for grilling with skewers. Use a Teflon® barbecue fish mat. - This is a perforated mesh mat that has been coated in a non-stick surface coating. You place the mat on your grill grates and then place the kebabs on the mat. A little cooking oil - I prefer to oil the fish rather than the Teflon® barbecue fish mat just to avoid any big drips and therefore the possibility of flare ups. Good quality bbq skewers - if you have skewers that are thin in cross section there's every chance that they will just cut through the pieces of cooked fish when you try to lift them off the grate, especially if any part of the barbecue fish kebab has stuck. A flat blade or better still an angle blade skewer gives a greater surface area for the cooked fish to "cling to" and so keep your kebab intact. Wrap your fish in bacon - I haven't done it for this barbecue fish kebab recipe because it wouldn't work flavour-wise but with basic seasoning it works a treat. Putting vegetables in-between the fish pieces not only adds colour but also helps the fish pieces cook more quickly. The result is more succulent fish thus less chance of drying out and again less chance of falling off the skewer. I’ve used tomatoes with yellow peppers to create a kebab with interesting colour contrasts, you can of course substitute the vegetables depending on what’s in season. Apologies for stating the obvious but the only allergen in this recipe is fish. Add the paprika, garlic and lemon juice to the olive oil and stir to create the base marinade. Dice up the swordfish and throw it into the marinade for about 30 minutes giving you enough time to light the barbecue. 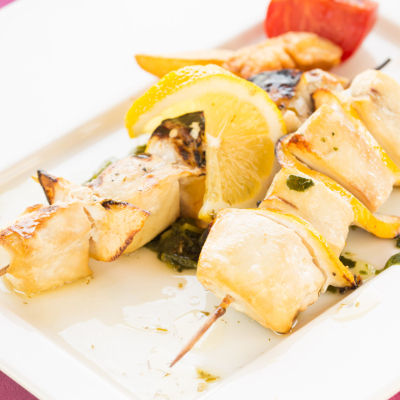 After marinating, put the swordfish cubes onto the skewers inter-layered with a tomato, onion wedge or yellow pepper. 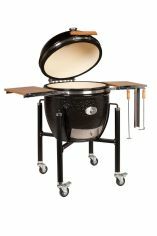 Place the kebabs on your grill mat for 5 – 10 minutes over hot coals brushing on the marinade during the cooking process. Note there is oil in the marinade so liberal brushing will cause unwanted flare ups. Turn the kebabs at the halfway point (continually turning a barbecue fish kebab is another way to encourage the fish pieces to fall off the skewer). To serve I like to keep it simple with some salad leaves in a grilled pitta and there you have it! Note: - Swordfish is regarded as an oily fish so it's a good healthy one to eat. Generally speaking it is a white fish but the color of the flesh can vary according to the diet of the fish.